Rubber bracelets are the best way to promote your business, support a cause, or remember a loved one. If you are a fan of professional sports then surely you have see one of your favorite players wearing a rubber bracelet. That is because they are extremely comfortable and can be worn 24/7 without getting in the way. Even though they are such a popular item, many people are not aware that you can order custom rubber bracelets. Custom rubber bracelets can be ordered to your exact specifications therefore the possibilities are endless! Using our custom rubber bracelet designer you can create a unique wristband in minutes. Choose a specific color using the Pantone Matching System (PMS) and add a logo for a custom touch. Choose from a standard youth or adult size or create a custom length and width. We offer many different message options such as screen printed, ink filled, embossed and debossed. The minimum order quantity for a fully customizable wristband is 50 pieces but we offer other options that can be purchased with no minimums. Personalized rubber bracelets such as Laser Debossed or Dual Layer can be delivered as soon as tomorrow! Order 1 – 10,000 and choose from hundreds of our stock colors, fonts and clipart. Do you like finding a good deal? Check out our discounted colors and save up to 50%. We guarantee that all of our rush orders will ship on time so you can focus on what is important. We have produced tens of millions of wristbands for hundreds of thousands of customers and counting. No job is too small or too difficult. Our operators are standing by via call, chat or email to help walk you through the process. We never substitute our wristbands with latex. 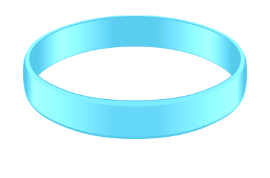 Our rubber wristbands are 100% non-allergenic.